Elgin Baylor (22), of the Los Angeles Lakers, makes a basket with Jerry Lucas (16) of the Cincinnati Royals, trying to stop him. BEVERLY HILLS, California — The views from Elgin Baylor’s house are spectacular. And other aspects of the place aren’t bad either. Located on a private road in one of the nation’s most exclusive neighborhoods, the estate covers more than 8,000 square feet. The Basketball Hall of Famer’s wife of 40 years and best friend, Elaine, furnished and decorated the place immaculately, creating a stunning home that would jump off the pages of any magazine featuring the world’s most impressive living spaces. “She couldn’t have done it without me,” Baylor told a visitor recently, tongue planted firmly in cheek. Quickly, you get it. You understand why the Baylors enjoy their longtime spot so much. But of all the things that make the house special, the views top the list. From multiple decks and every room, downtown Los Angeles is in your sights. At night, while watching the light show, one of the biggest athletic stars in the city’s history often reflects on his good fortune. On Friday, a statue of Baylor will be unveiled at the Staples Center, the downtown L.A. arena where the Los Angeles Lakers, the team for whom Baylor starred his entire 14-year NBA career, play their home games. Early the following week, Baylor’s autobiography, Hang Time: My Life in Basketball, will go on sale. In conjunction with the release, Baylor will embark on a book-signing tour, returning to Washington, D.C., where he was reared, on April 11 for an event at the National Museum of African American History and Culture on the National Mall. It’ll be a whirlwind of publicity for the reserved Baylor, 83, who isn’t one to tout his monumental accomplishments as a pioneer both on and off the court. Many close to him, though, have been gently nudging Baylor for years to tell his story in his own words. The book and statue unveiling figure to reintroduce the onetime superstar to a generation of hoops fans who most closely associate him with the NBA’s Los Angeles Clippers, the team he led as general manager for 22 years (in 2006, Baylor won the league’s Executive of the Year award) until he was relieved of his duties shortly before the 2008-09 season. The NBA owes much of its global popularity, and today’s star players can directly trace their eight-figure salaries, to the foundation laid by all-time greats like Baylor. Now, he’s in the spotlight again. The numbers tell a story of dominance. 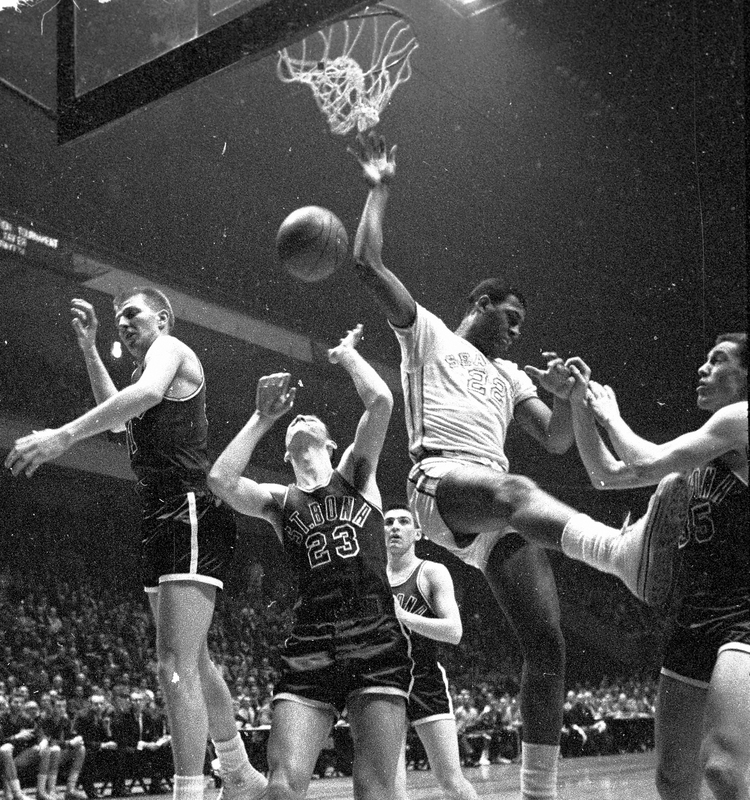 After he led Seattle University to the 1958 NCAA tournament championship game, Baylor was the NBA’s No. 1 overall pick that year by the then-Minneapolis Lakers. An incredibly gifted athlete with a basketball IQ to match, Baylor would go on to become an 11-time All-Star and 10-time first-team All-NBA selection. His first season, he averaged 24.9 points and 15 rebounds and was voted Rookie of the Year. His next four seasons, Baylor averaged 29.6, 34.8, 38.3 and 34 points, respectively. Once, Baylor scored 71 points in a game, which is tied for the league’s eighth-highest total. Baylor’s 61-point performance in an NBA Finals game is still a Finals record. Baylor’s unique highlight-reel-worthy moves thrilled fans and revived the Lakers franchise. The team won five league titles in the late 1940s and early 1950s. Then, Hall of Fame big man George Mikan retired and the Lakers became just another struggling team. Until Baylor arrived. There just wasn’t anyone else who moved as Baylor did while going to the basket. His stardom fueled the franchise’s move to L.A. before the 1960-61 season. “Yeah, I could score a little,” said Baylor, whose career scoring average of 27.36 points per game ranks third in NBA history, behind only Jordan (30.12) and Wilt Chamberlain (30.07). At 6 feet, 5 inches and around 225 pounds during his playing days, Baylor was a wing forward who rebounded better than most bigger players. Of the nine players who rank ahead of Baylor in career rebounding average (13.55), all are power forwards or centers. A knee injury in an era before arthroscopic surgery robbed Baylor of some of his athleticism. Still, he managed to play at a level most in the NBA have never reached. Hall of Famer Julius “Dr. J” Erving can tell you all about Baylor’s game. Dr. J spent much of his youth studying it in hopes of emulating his favorite player, and he’s pleased his friend is finally getting the recognition he deserves. Statuary at Staples Center is handled by the arena’s owners, who also own the NHL’s Los Angeles Kings, not the Buss family, which owns the Lakers. Jeanie Buss, the Lakers’ controlling owner, was very supportive of Baylor joining fellow franchise icons Jerry West, Magic Johnson, Kareem Abdul-Jabbar, Shaquille O’Neal and announcer Chick Hearn in bronze. Kobe Bryant, who retired after the 2015-16 season, will undoubtedly be the next up. If the process were based on merit alone, Baylor would have been in bronze long ago, said West, his former teammate and friend of almost 60 years. “He had an incredible instinct to score. But he also had an incredible instinct to rebound. I just marveled at him. He was truly a highlight film,” said the Hall of Famer, who as a player led the team to its first NBA title in L.A. and as an executive constructed Lakers rosters that won another six NBA Finals. That’s the way Erving remembers it too. In his well-regarded 2015 book, Elgin Baylor: The Man Who Changed Basketball, author Bijan C. Bayne chronicled what West, Erving and others observed. “The style of basketball that we accept as conventional today all comes out of him,” Bayne said. “Go away from the stereotype of Elgin [starting] the lineage of Michael [Jordan] and Dominique [Wilkins]. People get caught up on the hang time and the elevation, but he wasn’t, for most of his career, Dominique or Vince Carter; it’s more subtle than that. Although listed as a forward, Baylor actually played multiple positions. His versatility also set him apart. Perhaps that’s why he identifies with LeBron James. Baylor wasn’t as physically imposing as James, but “our style of play was similar,” Baylor said. “I would handle the ball. I’d bring it downcourt when teams would press. I’d do different things in the offense. On defense, I’d guard different guys. 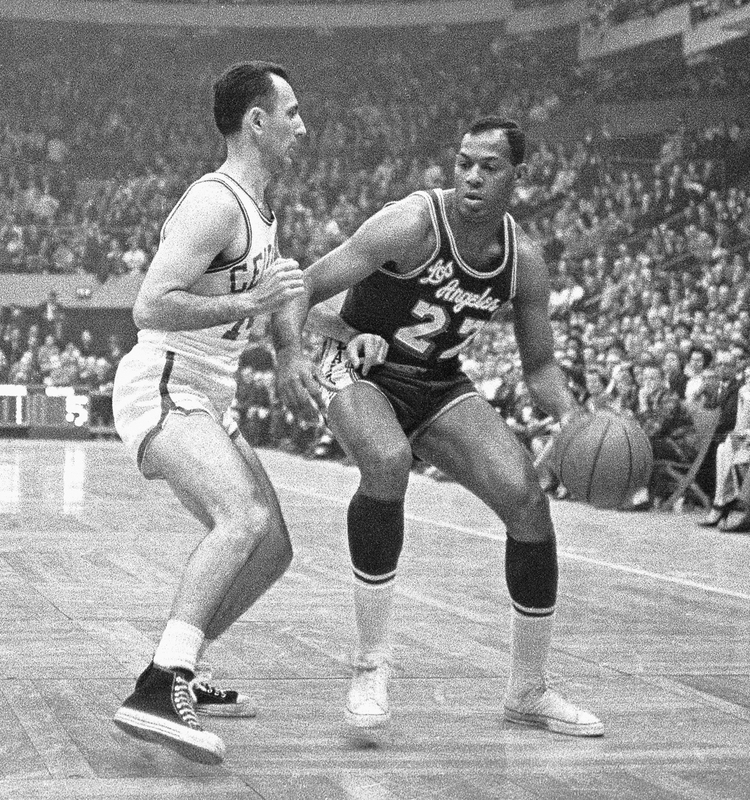 (Original Caption) Elgin Baylor (right) of the Los Angeles Lakers tries to maneuver the ball around Bob Cousy of the Boston Celtics during second half quarter action. The NBA Baylor entered was integrated, but only barely. At that time in both major college basketball and the pros, there was an unwritten rule, some NBA old-timers say: Teams could play one black player at home, two on the road and three if they were losing. When Baylor joined the Lakers, there were only two other African-American players, both reserves, on the team. In his early years in the league, Baylor was a rarity: An African-American franchise player. And as such, Baylor commanded respect. Even as a rookie, Baylor protested against racial injustice despite it being particularly dangerous for blacks to do so. Baylor had bad memories from growing up in segregated Washington, D.C. As an adult, he refused to back down. During the burgeoning civil rights movement in the 1960s, Baylor wasn’t as publicly vocal as activist superstars such as Bill Russell of the Boston Celtics and Jim Brown of the Cleveland Browns. In his own way, though, Baylor made a difference. By the time West arrived through the 1960 draft to start the Lakers’ first season in L.A., Baylor was already at the top of the league. The wide-eyed rookie followed Baylor’s lead. 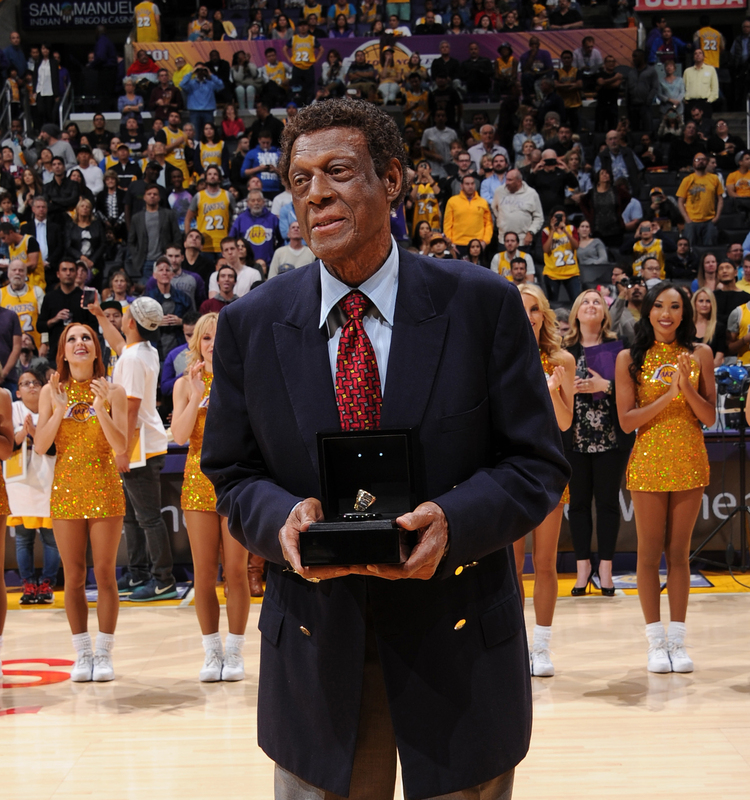 Hall of Fame forward Elgin Baylor is honored during halftime of the game between the Golden State Warriors and Los Angeles Lakers on Nov. 16, 2014, at Staples Center in Los Angeles, California. A championship is the one thing missing from Baylor’s résumé. As a player, coach (for three seasons in the late 1970s, he led the then-New Orleans Jazz) and NBA executive, the game’s biggest team prize eluded him. Repeatedly, though, he came close. Eight times, Baylor reached the NBA Finals. But unfortunately for him and the Lakers, their run coincided with that of the Russell-led Celtics, the greatest dynasty in the game’s history. While forging the NBA’s best rivalry, the Lakers and Celtics also spurred fan interest in the league overall. They had some classic Finals battles — all of which the Celtics won. “Man, you just couldn’t beat Russell,” Baylor said of his longtime good friend. “The focus he had was incredible. The minute the game started, you saw something change. You just couldn’t get him [rattled]. In what some probably would consider to be a cruel blow, the Lakers won their first title in L.A. during the 1971-72 season — the season in which Baylor retired after nine games mostly because of lingering knee problems. The team also reeled off an NBA-record 33 consecutive victories. What was Baylor’s reaction to the Lakers’ finally having broken through without him? With a statue to unveil and a book to promote, Baylor doesn’t have time to dwell on one disappointing chapter in an otherwise great life. There’s too much work to do. And when he’s finally done, Baylor will return home and enjoy the view again. It’s only getting better.